The School is recognized by the Secondary Education Department of Uttar Pradesh (Anglo-Indian Board) up to class VIII. We follow CISCE pattern as girls completing their studies may join Maulana Azad Girls School, for admission in ICSE or other school following the same pattern of education. English is medium of instruction. Mathematics, Science, Computer, General Knowledge, Environmental science (Class I & II), Social Studies (Class III to V), History, civics and Geography from Class VI onwards. Art, Moral Science Special arrangements have been made for teaching of Quran for Muslim students. The admission form and prospectus will be available in the first week of December. The last day of submission of forms for registration is 31st December. The admission forms may be obtained from the school office during the school hours or downloaded from the school website. The school provides coeducation up to class V. Thereafter only girls are allowed to continue in higher classes. The admission form should be duly filled and submitted at the school office along with the registration fee. 1. Proof of date of Birth. 2. 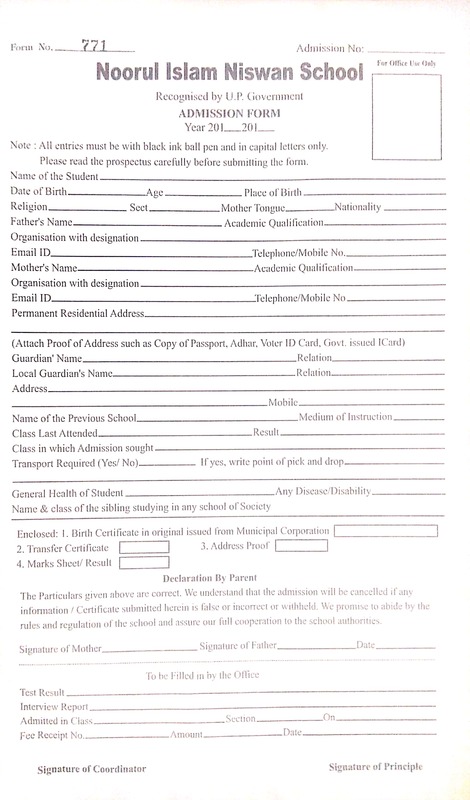 Transfer Certificate in original (For admission to class 2 onwards). 4. Passport size photograph of the child. The result of the selected candidates will appear on the school notice board. The guardians should complete the admission process at the earliest otherwise the seat will be assumed as vacant and will be allotted to the next candidate. Copy of the Result card of the previous school and original Transfer certificate should be submitted at the time of admission. All certificates will be cross checked with the original documents. The admission are given on the basis of admission test and interview. School does not believe in any discrimination on the basis of religion, caste or colour. The admission form should be completed with utmost care. The school will not allow any change after the submission of the form. The students applying for admission to pre-primary classes (Pre Nursery, Nursery and KG) will not undergo any screening procedure. The parent and children will not be subjected to interview to decide the admission. The students seeking admission up to class I will be asked to appear for the counselling session on pre announced dates. The school will evaluate the present and past academic performance, special requirements and support needed for the present class. Candidates seeking admission to class II onwards should have knowledge of the previous class syllabus. He/ She must have passing certificate of the previous class whether they are seeking admission to the next class or want to retain the same class. The students seeking admission in class II onwards will have to submit the result card from the previous school. Admission may be given to students who are studying in other school in good faith on the basis of information furnished. However the admission will be confirmed only after the criteria for admission is complete in all respects. Last day for payment of admission fee and other charges will be announced by the school after which the admission will stand cancelled without any prior notice to the candidate.